Velma Seawell Daniels has dedicated her life to spreading joy. She is active in the Christian community and is often quoted in sermons. She has also made a successful career of writing books that attempt to inspire happiness. Daniels currently lives in Florida. She is the book editor for the News-Chief Publishing Group. She is also a popular speaker, attending both national and international conferences. Daniels wrote Patches of Joy about people, both famous and quite ordinary, whose lives have been inspired through acts of faith, hope, and love. Her many other titles includes To Brighten Your Day, also published by Pelican. The theme of this book is joy. The characters, whether famous or ordinary, have at least one thing in common—they have inspired others through acts of faith, hope, and love. 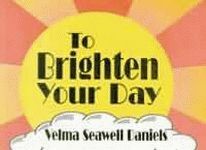 Velma Seawell Daniels believes in these things, as well as in a multitude of anecdotes, quotes, and biblical scriptures, which she shares in her new book, To Brighten Your Day. Mrs. Daniels wants everyone to be able to do much more than to take the time to stop and smell the roses. She invites you, as an Indian love song says, to “walk on a rainbow trail; walk on a trail of song,” because then, “all about you will be beauty.” If you can learn to do this, if you can see beauty everywhere you look, then your days will become happier and brighter. Paperback.